Scott Francis is available for all types of events and meetings. Scott’s experience reaches beyond 30 years of performances ranging from small to large venues. His ability to connect with his audience is outstanding and those who have attended his presentations thoroughly enjoy the shows. Scott Francis has a background as a comedian. He had worked over 170 comedy clubs as a headliner before he entered the speaking arena. It was a simple transition as he always worked CLEAN. Being a comedian helped him to create a fast-paced presentation with a laugh every few seconds. Scott believes that you retain the information longer if you laugh while you learn and add visuals to enhance the message. And it has been proven that this method accelerates the learning process. He is able to customize his program to hit on a few of the challenges you would like addressed in your organization. Speaker Scott Francis will infuse your audience with motivation and inspire them to take action! He will pull at their heart strings, awaken their inner “can-do attitude,” and give them the shot in the arm they need to get up and get moving!! They will be encouraged to take care of themselves so they can be better equipped to conquer a day at work with the best of themselves! Scott Francis shares the easiest and quickest way to change your attitude!! Whether you want to increase sales, deliver over-the-top customer service, lead with confidence, or just get along with all types of people, this is the program for you! Come learn the keys to achieving the ultimate in “making a difference” in your life and your career. Scott Francis has worked for over 80 Fortune 500 companies on a repeat basis. His clients say it again and again, “It was the BEST event ever.” He is intent on making your attendees laugh all the while imparting key information that will impact them for years to come. What this means for you, the event planner, is that Scott is easy to work with. When the event is over, he wants you to be the one to take the bows and will do everything he can to make sure the event is a success. Whether that means bringing his own lights to make sure all his crazy antics can be seen, or bringing his own sound system (up to 150 people) to ensure that everyone can hear his comedy he will do whatever it takes! 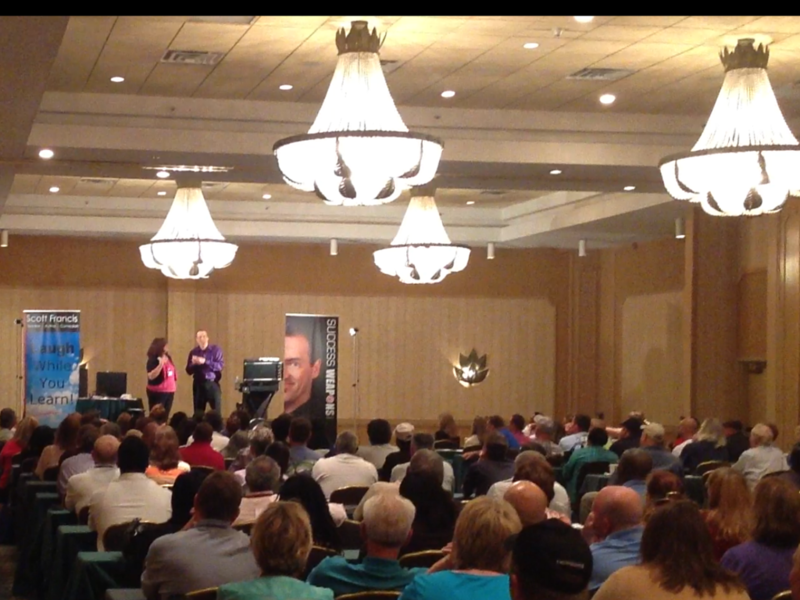 SCOTT FRANCIS CUSTOMIZES ALL OF HIS SPEAKING PROGRAMS ACCORDING TO YOUR INDIVIDUAL NEEDS IN 3 EASY STEPS. Decide on three main topics that you would like to convey to your group. Example topics are; passion, leadership, attitude, commitment, perseverance, handling change, sales, customer service, or choose your own theme and topics. Scott will take it from there. In the 20 plus years of having our yearly meeting, Scott Francis was the first presenter to get a standing ovation!! Become the go-to person in your industry.